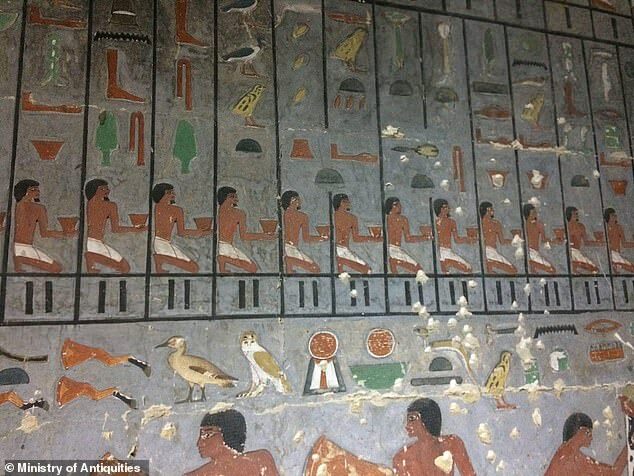 An ancient Egyptian nobleman who lived 4,300 years ago has been discovered buried in a L-shaped limestone tomb decorated with brutal murals. 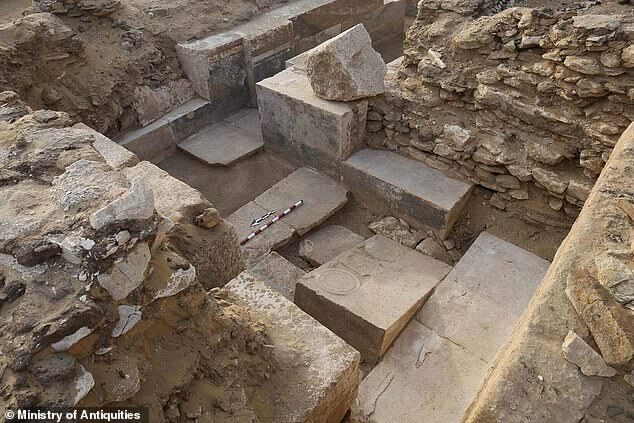 It had previously been raided by tomb robbers but remains of the nobleman, believed to be called Khuwy, were found scattered among the blocks. 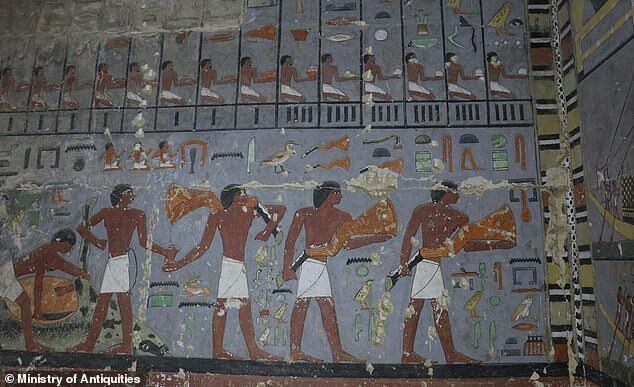 Many of the paintings inside the tomb include original pigments and hieroglyphs which depict scenes of carrying cuts of meat as well as slaughtering cows. The unusual site dates back to the 5th Dynasty, which ruled the Nile Valley from 2388 -2356 BC. It was found in the Saqqara pyramids complex outside Cairo. Dr. Mohamed Megahed of the Egyptian Ministry of Antiquities customs Ahram Online that The mission found the chamber via two entrances in the west wall of its antechamber. He added: 'It seems that the space of the burial chamber was almost completely filled with a limestone sarcophagus, which was found entirely destroyed by ancient tomb robbers His remains, although vandalized, were once mummified, the experts found. Resins and oils used to preserve the body were identified at the site. This tomb's greater structure includes a descending corridor with a small hallway leading to an antechamber. Archaeologists also found evidence of a little-known queen, called Sebtihor, among the many inscriptions, on a red granite column. It is believed she was the wife of Djedkare Isesi, the eighth and final ruler of the Fifth Dynasty. Schools previously found an anonymous tomb dedicated to him in the nearby area, but it remains unknown if this is its twin for the married couple. Further study of the site is expected and researchers hope to find evidence of the period between the fifth and sixth dynasties.